Boing Boing has linked to a prototype cat door that uses facial recognition to assure that your cat isn't brining a dead bird or mouse into your cat infested house. When the cat approaches the door a digital camera snaps a picture that is then checked by a computer to make sure the cat is alone. I would add a weight sensor system to assure the inbound cat is within a few ounces of it's outbound weight. Why take technology like this seriously? Because it points to the future and gets people thinking about innovations that can improve daily life for a wide audience. Here's an idea being tried in Australia. Offer urban apartment dwellers a free Smart car with purchase of a special half size parking space for it thus saving the developer valuable parking garage square footage. This seems like a brilliant idea for city dwellers. While this Australian test case is for apartment dwellers who want a second car and parking space I can imagine that this system could be used with a remote garage or parking lot where people could park their SUV, Truck, van etc. and swap to it from the Smart car when the alternate vehicle is desired. Alternatively, larger vehicles could simply be rented as needed. Many city dwellers already do this for weekend getaways from the city. Progressive urban regulators should embrace such approaches to space saving in new urban buildings. Architect Philip Johnson, who is credited with bringing some of the ideas of European modern design to the United States and transforming them into a uniquely American form, has died at his home in New Canaan, Conn. He was 98. Among his most famous designs are the Glass House, his own home in New Canaan, a glass building with an exposed steel frame, New York's Seagram Building, which he designed in collaboration with Mies van der Rohe, and the elliptical shaped 53rd at Third, also known as the Lipstick Building, in New York City. 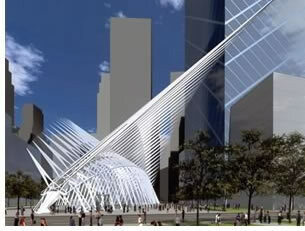 Johnson is also known for his Post-Modern icons such as the chippendale topped AT&T Building in New York. 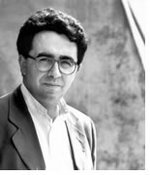 Architect-engineer-artist Santiago Calatrava, FAIA, whose soaring structural poetry in bridges and buildings has garnered international acclaim, was selected December 2 by the AIA Board of Directors to receive the 2005 AIA Gold Medal. The highest honor the Institute confers to an individual, the Gold Medal recognizes an individual whose significant body of work has had a lasting influence on the theory and practice of architecture. Calatrava will be presented with the medal at the 2005 American Architectural Foundation Accent on Architecture Gala, February 11, 2005, at the National Building Museum in Washington, D.C. The Great Garage trend I first wrote about over a year ago seems to be gaining traction. Whirlpool, wanting to find a way to sell more appliances, has seen some success with their GladiatorGarageWorks line of specialized appliances, storage systems, workbenchs and wall panels. 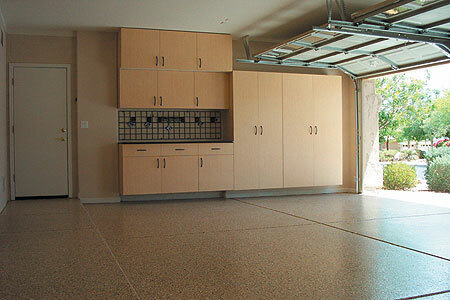 Americans are discovering the garage as the next space to get a makeover. We're still waiting to see the growth of the vehicle turntables and car stacking systems that I think will find their way to the US soon. In the Great Garage II I mentioned that the "hisandherification" of everything in the home was expanding to include his and her garages. His garage is about horsepower, yard and driveway maintenance and vehicle restoration while her garage is about the kids sports equipment and gardening tools. A generalization I admit but a trend in the making here. The rugged masculine lines of the Gladiator system just won't do in her garage. A system like this from Premier Garage seems to be much more refined and gender neutral. Featuring simulated granite flooring and sleek cabinetry these systems seem like a must for anyone serious about pimping that sweet new five car. As Friday officially kicks off this year's holiday shopping season in the US I welcome the news that LEGO has an innovative program going on that leverages the power of the Internet to create a competition that also returns the struggling toy maker to it's roots as a building toy. Sell the LEGO set you designed around the world! Get your model mass produced and packaged in the REAL LEGO production line in Denmark! Get to name your LEGO set, including your name, on the actual LEGO box. Get 25 boxes of your LEGO set for free! Most cool of all… You will get 5% royalty on each set sold.. directly into a college fund or savings account! Forget movie tie-ins and action figures this is true to what Lego is all about. To early to tell but here's hoping that it's the front edge of the reemergence of a great global brand. This collection of then and now photos of New York City is amazing. The accuracy is incredible. The photos are taken from the exact same locations. What's most striking is how much remains unchanged over some 60 years. Sure there are plenty where the entire fabric has been changed as smaller older buildings are replaced by larger modern structures but so many of the photos are almost identical. A great way to spend a Sunday afternoon online. 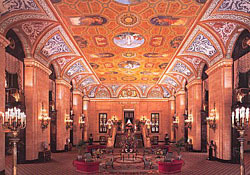 Chicagoist reports that the Chicago icon The Palmer House Hotel is for sale. $250 million or $182,000 per room buys you a piece of Chicago history. Hilton will still run the place you just get to walk around like you own the place. Visited the mall this weekend for the first time in a long time. Even though we went on a specific mission I wanted to make time to visit the Apple store to spread some drool around. I hadn't had a chance to see the new iMac or the new iPod. These are good things. What strikes me is how different it feels to browse and shop in an Apple store vs any other store that sells computers. It's simple really - the coolness of the well designed products in a well designed experience(store) is a strong combination. It's probably why Apple started their successful retail stores in the first place. They realized that a retail environment and thus experience that they could not design and control only subtracted from the appeal of their products. Cool Apple products languishing on unkempt dust covered shelves of the stinky "warehouse chic" big box retailers was hardly a plus for the brand. Clean, bright, well staffed,nice smelling and well organized add up to a winning experience. Interestingly, I headed for the Apple store as my lady friend headed for the candle store. Two remarkably different experiences worth having for each of us. Is your store a great experience? Do the stores your products are sold in provide an appropriate experience? Something to think about.